Your church’s website is important. Not only is it important to your existing congregation but it is also important to your local area and growth of your church in reaching the “unchurched” population. Many church website’s are rather simple, which is fine, but there are some features you should definitely not be without. I consider the 10 features below and the top 10 must have features for your church’s website. Not only will these features help you keep your current congregation in the know in regards to the goings on of the church but, they also allow you to reach those outside of your church’s walls – a vital aspect for every church. This is pretty much a given but, you would be surprise how many churches do not have a phone number of email on the site for people to reach out to for more information. Make sure your church’s website has its name clearly positioned as well as the denomination (coming from an area that had many churches- some with the same name trust me its helpful). It is also helpful to provide some general information about your church such as the name of some of the church officials as well as a brief history of the church. 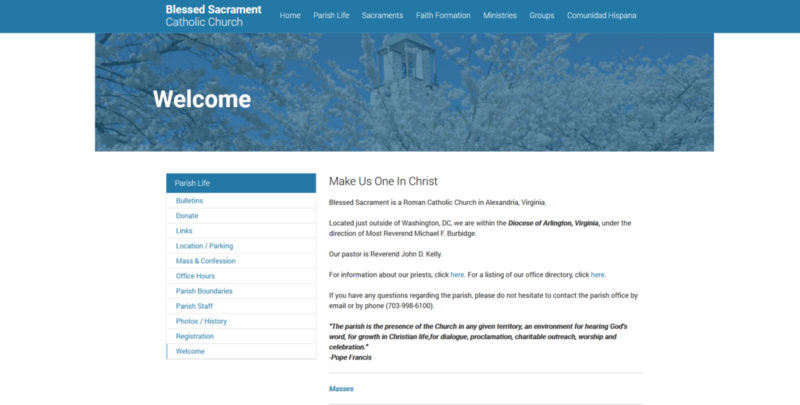 A good example of a welcome page (not the homepage per say but a separate welcome page) is found on the Blessed Sacrament Catholic Church in Alexandria, Virginia. Its very simple but provides all the information you would need. The only recommendation I would make to this site is that Blessed Sacrament Catholic Church in pretty generic ( I know at least 7) I would mention the location Alexandria below the name so people can identify immediately with it geographically. This one is also a standard but some churches fail to mention their service schedules. Have a schedule of your services is especially helpful to new visitors to your church. Remember the purpose of your church is to further discipleship and the first step in doing so is by letting visitors know the times and days of worship. 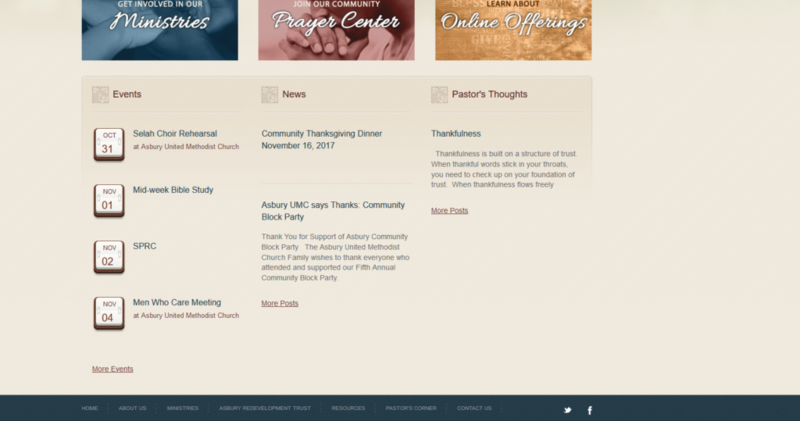 Calvary United Methodist Church in Frederick, Maryland keep its real simple and places the day and times of service front and center (literally) on its homepage. If your church offers different types of service such as a traditional and contemporary service it is a best practice to provide a brief description of each service so visitors know what to expect out of each service. Useful information may include service outline, style of the service as well as acceptable wardrobe if applicable. The First Baptist Church of Greater Cleveland does this extremely well as seen below. It is likely that your church has various ministries within it. From Youth Ministry, Music Ministry and many more. 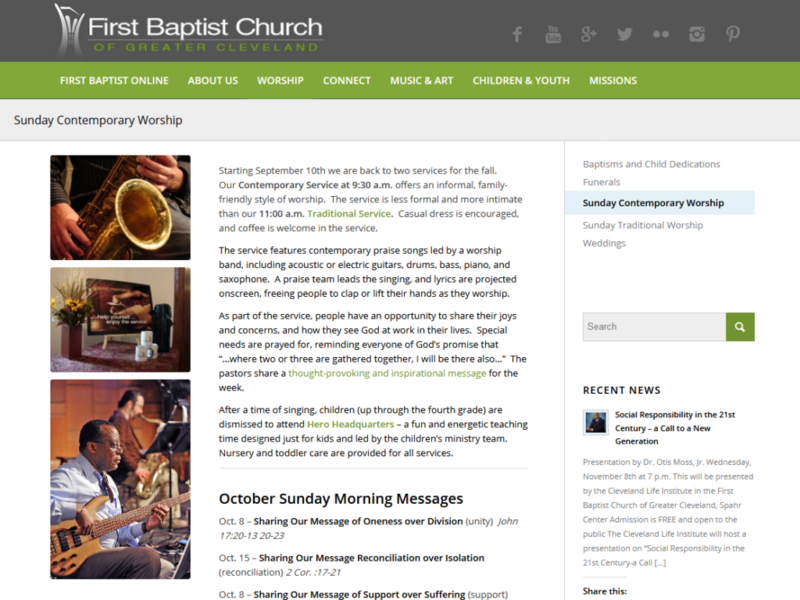 It is important that your church website has a page dedicated to each ministry such as below from First Baptist out of Cleveland. These pages should have basic information on the ministry, its goals as well as its members as well as contact information for the ministry leader. Many churches are linked to other nonprofit organizations and regularly seek donations to further the church’s mission. Traditionally churches rely on in-church collections but by having a donation page on your church’s site will allow individuals to make donations online. Some people may be self-conscious about delivering the money in-person and would prefer to donate online. Having this functionality would greatly boost your donation efforts by giving your congregation another channel to donate from. We live in a social generation and having a presence on social media is crucial to the modern church. Being active on Facebook, Twitter, Instagram and twitter are key to spreading the word of God to the younger generation. These social networks should not exist in a vacuum either. Make sure that they are connected to your website so visitors to your site can visit your social profiles. The integration doesn’t have to be anything fancy and can be something as simple as placing your social icons in the header or footer of your church’s website as seen below. This is, in my opinion, one of the most important features that a church website should have. The sermons are the bread and butter of a service. Many churches don’t share their priest’s or pastor’s sermons but there is are many great benefits from doing so. You can give visitors a taste of the type of sermons that are common in the church. Many sermons answer deep and profound questions some may have and by putting them online you are making use of SEO and content marketing to putting the sermon in front of millions including many millions of the unchurched. 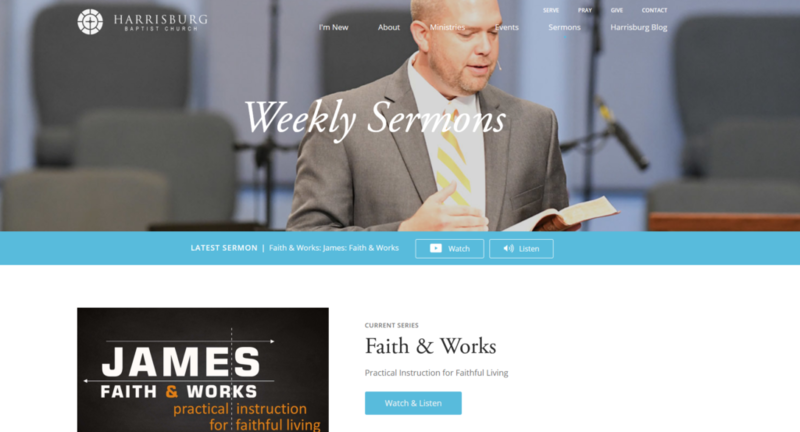 Sermon pages can drive hundreds if not thousands of visitors to a church website. Its unique and interesting content and because of the length of the content contains many keywords that you can rank for. It would also be worthwhile to consider providing the a video or audio version of the sermon similar to what the Harrisburg Baptist Church does as seen below. Granted some of the people who see that content may not be members of the church and they many not even be in the same region as you but the that is the point isn’t it. Reaching the unreached and providing information on God’s Word. Most people don’t consider a blog as a crucial part of a church’s website. I couldn’t disagree more. I think having a blog set up to information the congregation as well as visitors about church events and happening is very important. Every church I have ever been to has a church bulletin with all the latest and greatest occurring in the church. A bloc would just be a digital bulletin. You can even have separate categories set up such as Church News, Church Events, Pastor’s Corner, etc. The Pastor’s Corner or Father’s Focus section of the blog would be a great resource for the church priest or pastor to present their commentary on various events and news. I have seen a number of church blogs with a similar feature wherein the Pastor or Priest provides commentary on current events. Also a very important “Must-have” page, a page for new visitors to your church would provide first time visitors to your church with all the information they would need to allow them to feel comfortable and knowledge when they first step inside the door of your church. This includes a special welcome to new visitors, service schedules, a church directory of important contacts within the church, etc. Many churches only think in terms of their current congregation and forget entirely that a growing church needs new members and key to that is making your visitors feel welcomed. I’ve seen many first time church visitors wander and confused like chickens with their heads cut off, not sure who is who and where they need to go. A visitor’s page will help you make great strides welcoming new visitors to your church and help guide them to membership. Northside Baptist Church in Rock Hill, South Carolina is a good example of a great welcome page. The only change I would recommend for Northside would be to add more visual elements such as photos of the congregation and of the church to give it a more personal feel. News and events that are occurring in your church should not only be known to those who attended on Sunday. I can tell from personal experience of missing a service and because of it, not knowing about an event from having. Church events, whether exclusively for the congregation or for the local community at large (a great way to increase awareness in the local area by the way), should be promoted on the church’s website – not only on the blog but with a special section on the homepage as well so everyone see it. Your church’s websites is a crucial tool in your strive for growth of your congregation as well as engagement of your existing congregation. The 10 features mentioned above will not only help you spread the Word of God to more people but will also keep your current congregation engaged and thriving. 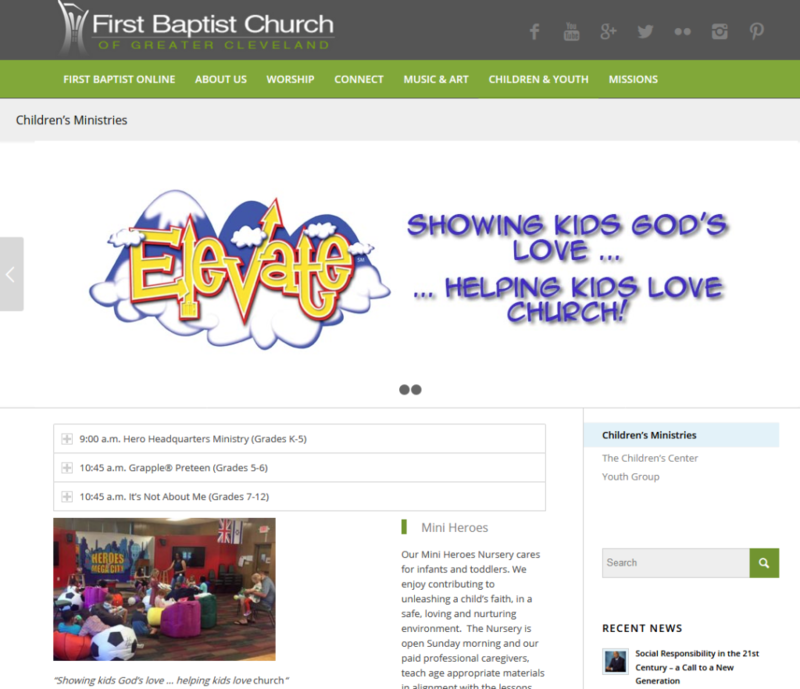 We understand that church website design can be difficult for those without the technical skillset required to do it. Your job is to spread the God’s Word. Our job is to help provide you with the latest digital tools to do that. That is why MarketingModo is your partner in church website design.